Cozy, textured, and incredibly warm, a drawer full of sweaters is a welcoming sight when the temperature starts to drop. Caring for these cold-weather staples is essential to ensuring their longevity, but remember, care methods can vary by fiber content. A cable-knit pullover made from cotton can withstand different handling than a cardigan rendered from cashmere, for example. We’ve got you covered—much like your sweaters—with a complete guide full of expert tips and key items to add to your knitwear care arsenal. Cashmere is one of the most sought-after fibers, sourced from a particular kind of goat in the Kashmir region of India. It’s finer and softer than other types of wool. While you may think a professional cleaning is the best way to go, think again. Laundering this delicate material at home, using the following steps, will help to extend its lifespan. First, you’ll need to pre-treat. 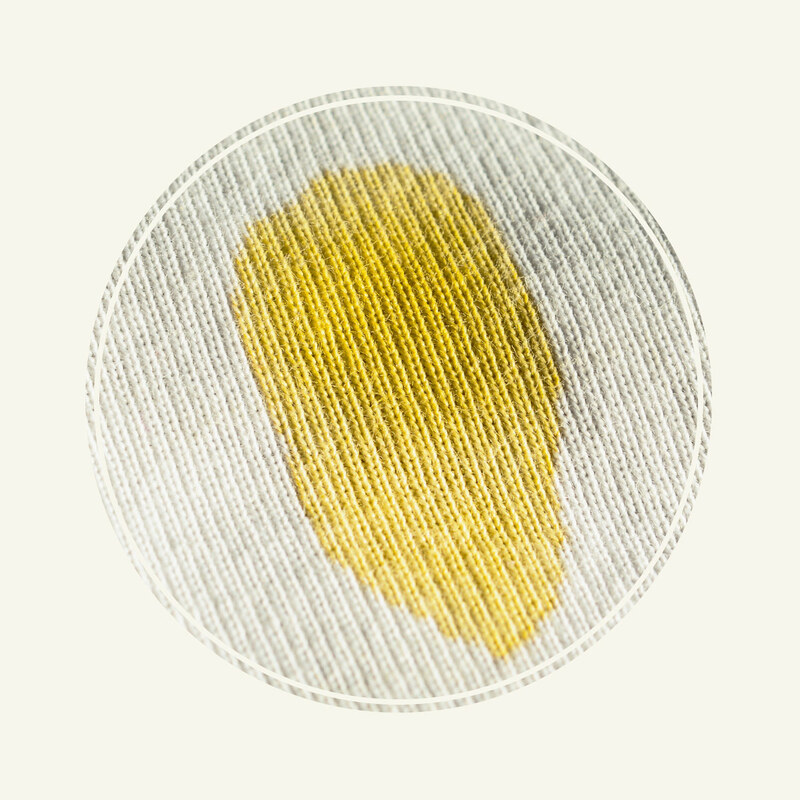 Blot with a clean cloth or paper towel, then soak in water mixed with a gentle, cashmere-safe detergent. 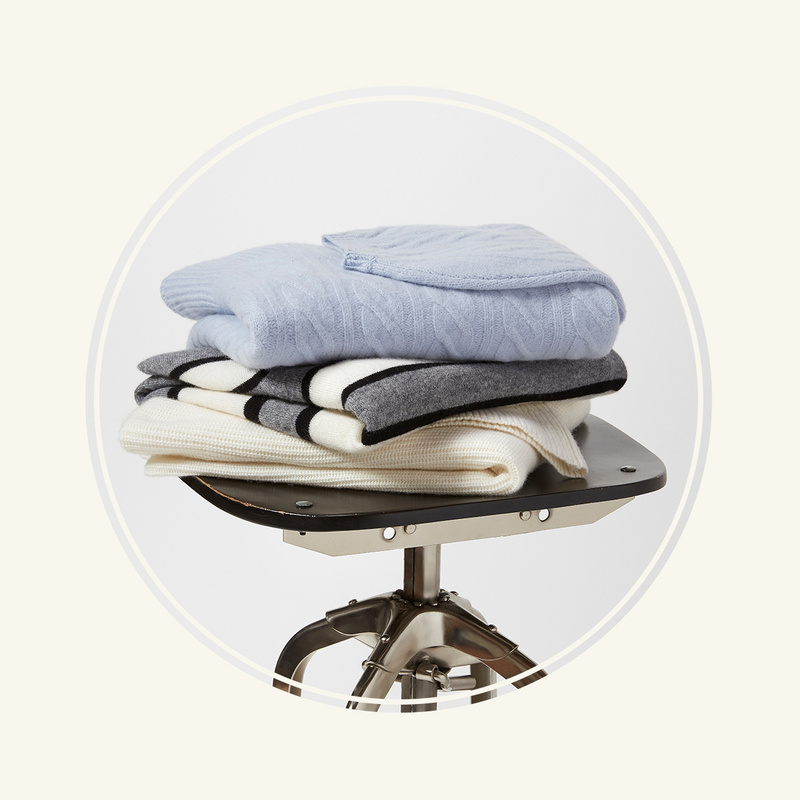 Dip a cloth in cashmere-safe detergent and rub gently. Use a cloth dipped in cold water and dishwashing liquid and rub gently. If a stain looks too daunting, consult a professional cleaner. After you’ve addressed any stains, you’re ready for a more thorough cleansing. Start by removing any pills (balls of fiber) with a sweater stone, then turn the garment inside-out. This is a good time to spot-treat the underarm area, which we recommend doing before every wash to prevent stains. 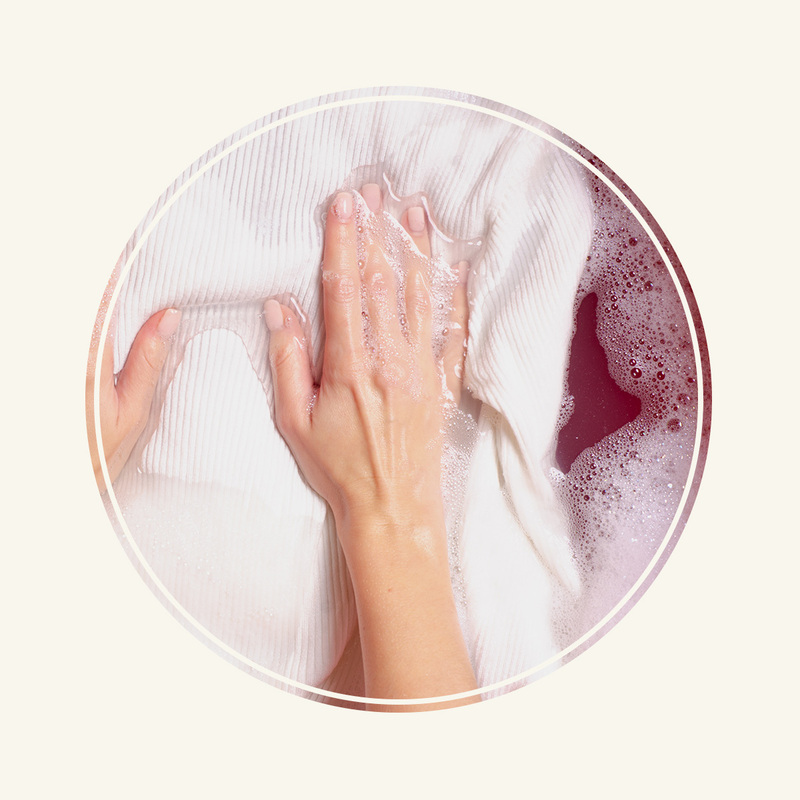 Add cashmere-friendly detergent to lukewarm water (never hot), agitate, and soak your sweater for 30 minutes. Rinse thoroughly under lukewarm water. TIP: If you don’t have cashmere-safe detergent handy, baby shampoo is a good alternative. Just never use machine detergent on cashmere, which can actually set stains rather than lift them away. Never put cashmere in the dryer. It needs to air-dry to preserve its shape and consistency. On that note, don’t shake or wring out your sweater either, as it may warp or stretch. Instead, use a towel to pat excess water off the garment, then lay it on the towel and carefully roll it up to absorb all the moisture you can. Use a drying rack to air-dry completely, laying the sweater flat so no parts are hanging. Want to learn how to care for all of your cashmere pieces? Dig into our complete guide. The best way to care for these cozy essentials is to clean them at home. When spills happen, use a clean towel or napkin to gently blot and lift the stain away. A damp washcloth and a bit of wool-friendly detergent (like Woolite) is your next line of defense. Because dry-cleaning can shorten your sweater’s lifespan, wash by hand whenever possible. Prep for an at-home clean by removing pills with a sweater stone. Turn inside-out and submerge in cool water mixed with two squirts of wool detergent, then give it a swish. Soak for 10 minutes before rinsing and removing. TIP: If you notice wrinkles, steam them out with a hand steamer or by hanging your sweater up in the bathroom while you run a hot shower. The drying process is a crucial point in avoiding warped or worn-looking sweaters. Don’t wring your garment once you’ve pulled it from the water, but rather, roll it up in a towel. Let it air-dry flat on a clean towel or drying rack and give it ample time before you fold and store. Even if you machine-wash, never use a dryer or forced heat. For more useful tips, check out our complete guide to caring for wool. Unlike its wool and cashmere counterparts, cotton sweaters are durable enough to handle more frequent, rigorous washing—even by machine. Before you begin, check for pills and remove them with a sweater stone. While hand-washing is always best, if you prefer to use your machine, select the gentle cycle to reduce pilling and wear. When in doubt, check the sweater’s care label for more specific information. TIP: What if your sweater is made from a mix of materials, such as a cotton-wool blend? Always follow the care instructions for the most finicky fiber (in this case, wool). To avoid shrinkage in the dryer, air-dry your cotton sweaters by laying them flat on a clean towel or drying rack. Cotton is prone to wrinkling, so use an iron or steamer to smooth things back out. 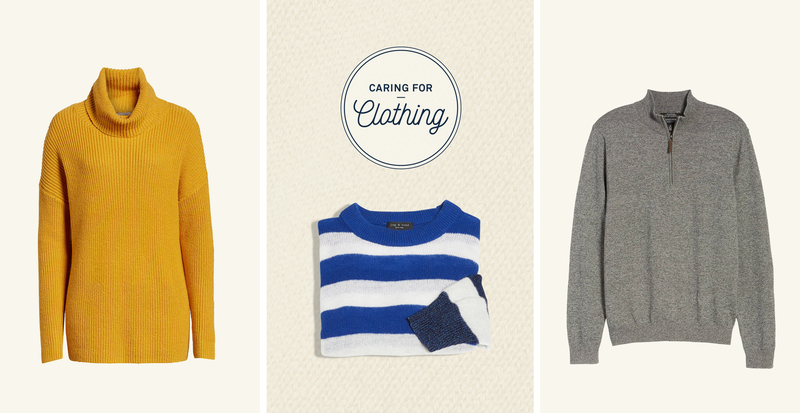 All of your sweaters, including cardigans, should be folded—not hung. Don’t overstuff your drawers, either. Give sweaters room to breathe, and be sure they’re completely dry after laundering before you tuck them away. During the off-season, fold sweaters into garment bags and store them in a cool, dry place. With this simple routine, they’ll be fresh and ready to go when you take them out next fall. Need help with the rest of your wardrobe? The Caring for Clothing Guide is here.